Addressing students' needs levels the playing field. Or rather, addressing students' needs is only leveling the playing field. If a child is hungry, then the need can be addressed by providing breakfast, lunch, and assistance as needed. The same applies if the child is unwell. Many schools have made great strides in addressing students' needs, but some schools have gone further. They have taken an issue that was initially a need and used it to enhance and improve what the school offers. Milwaukie High School, part of North Clackamas Schools in Milwaukie, Oregon, and winner of the 2013 Vision in Action: The ASCD Whole Child Award, is an outstanding school where each student is engaged in literacy, inspired by their cultural diversity, and ready for active citizenship. Milwaukie's staff works tirelessly to improve their students' academic, social, and emotional growth; to expand their educational practices; and sharpen the administration's focus on staff professional development, all to meet the needs of the whole child. David Adams, teacher leader (English and language arts). How has your school or community taken a challenge and turned it into a win? 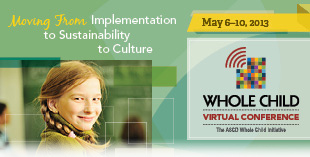 Join us throughout April as we look at what qualities principals in today's (and tomorrow's) schools need to fulfill their roles as visionary, instructional, influential, and learning leaders. 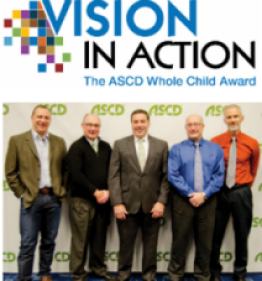 ASCD is honored to present Milwaukie High School, located in Milwaukie, Ore., with the 2013 Vision in Action: The ASCD Whole Child Award. This special award recognizes schools that move beyond a vision for educating the whole child to actions that result in learners who are knowledgeable, emotionally and physically healthy, civically active, artistically engaged, prepared for economic self-sufficiency, and ready for the world beyond formal schooling.